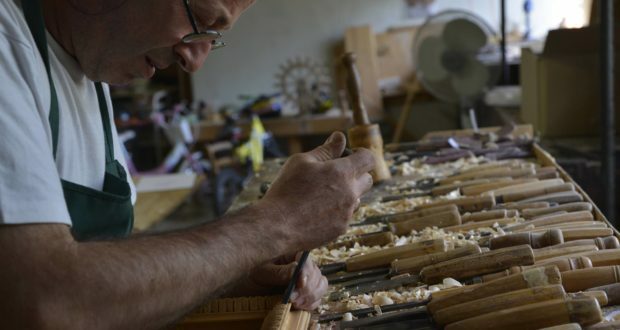 Speaking of wood carving now may seem like a thing for just hobbyists. Yet Florence gave the world the great masterpieces in this art. This mental Gap can be dispelled if we accept the fact that many small businesses have for centuries contributed in that the continuity of this art were insured over the years. One of these is undoubtedly the Bottega Romagnoli, historical company that was born in Florence in 1918. It has as founder Ferrando Romagnoli who saw him approach the learning of this discipline at a famous Florentine master, Giulio Campolmi, from everyone at time recognized as a true talent in art and teaching, according to the most virtuous of the workshop-school cliché, which in Florence it was continuously passed through the centuries, from the Renaissance to the early 60s of the twentieth century. In addition to the famous mirrors and Florentine frames, tables, headboards, finely carved consoles, Ferrando also learned, and more, what was the particular activity of the workshop of his Master Giulio, and that characterized the typical Florentine stigma of the era, internationally recognized. It was primary in fact the manual manufacture of tiny carved artifacts of which Florence boasted a record in the Great International European Exhibitions of the nineteenth and twentieth century. And then caskets, cabinets, astucceria, realized as well as with the manual carving technique, even with valuable technical praising the stylistic features of the Florentine Renaissance Revival. Ivory inserts, plaster, metals and precious and rare woods, of which the Medici collections was the promoter and patron. But even the most common objects to use of the nobles of the city, often foreigners. They stand out among all the famous “walking sticks from the master Campolmi” decorated by heads of griffins, dragons and Renaissance grotesques, the Anglo-Florentine of the age could not help missing at least a couple in their collection, as a distinctive sign of the city’s culture representatives who were. Or wooden objects for large kitchens manor whose carvings rise them from simple tools to small works of art in the typically Florentine sense to combine beauty and function. The transition to the second generation sees the company’s reins to his son Carlo Romagnoli that implements the production with the help also of machinery and a new laboratory outside the city proper to increasing orders, are the years when many students are trained in the workshop, and which will give rise, in turn, to other enterprises but not without cure properly and still cultivate the elite clientele made up of art connoisseurs, collectors, architects around the world. The third generation led by Filippo Romagnoli sees a new mission on establishing itself on e.commerce artisan market through the Etsy.com community-marketplace based in Brooklyn. The goal of connecting the ancient product of the founders, with the digital international market offered by ethical e.commerce now become a necessity. Thus it was born FlorentineTouch which proposes the combination of manual carving and food, through the revival of the ancient market items that have had an important place in business history. 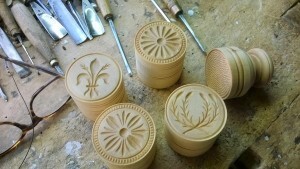 As the stamps for Corzetti carved by hand. The Corzetti are a format of Italian pasta, of medieval origin, medallion-shaped often with custom printed effigies that are imprinted indelibly on the dough by means of a mold carved to the negative. As well as rolling pins in precious wood, turned and hand-carved. The Florentine flair of Romagnoli workshop combined with the vision of the future did not delay the timely due recognition by important international magazines such as “Washington Post” and “I love italian food” …… and the story continues … .